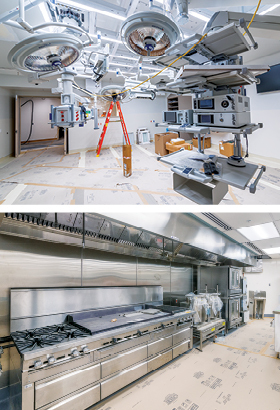 Highly sophisticated neuro, trauma, cardiovascular operating rooms, as well as a state-of-the-art kitchen are among key features of NorthBay Medical Center’s new wing. With major construction projects wrapping up and a big anniversary to celebrate, 2019 is shaping up to be a big year for facilities at NorthBay Healthcare. A project to expand NorthBay Medical Center’s Emergency Department is in its fourth and final phase, as an additional 10 beds were added in December, bringing the number to 29. The project also added two new trauma bays, one devoted to cardiac resuscitation, and three high-acuity beds with patient lifts. The final phase brought a new CT scanner into the department. At the same time, work on the three-story North Wing continues at a frenzied pace. The $183 million, 77,000-square-foot addition will host a new café, 22 high-tech patient rooms, eight new surgical suites and a post-anesthesia care unit. It will also be home to diagnostic and central sterile supply departments.